The other day, while I was at work, a summer storm rolled in -- the kind of rain that creates an instant lake wherever there is open space; the kind of rain that pounds like millions of tinfoil feet on roads and roofs. The sky went nearly black. The kids are done school for the year. I spend my days in the old building where I have an office made of real plaster walls. There is a peace in school with the kids gone. Sure, things are better with them around, because I get to teach, but the pressure level seriously decreases when the halls are silent. 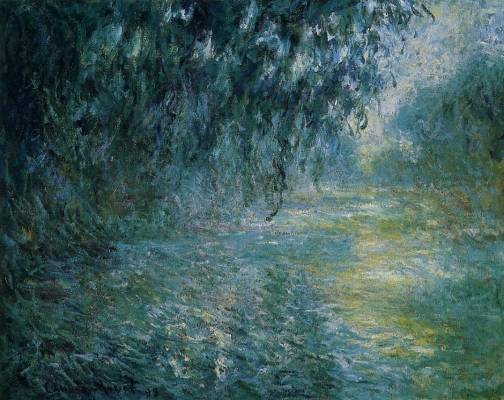 Monet -- "Morning in the Rain on the Seine." I spend my days with no tie on. (I despise wearing a tie. "Despise" is not a strong enough word, unless accompanied by an expletive, the likes of which I try to avoid on this blog.) And, tieless, I work on scheduling issues some of the time. The rest of the time, I prepare and study for the classes of the coming year. This year, it is advanced English and "College Composition." I have a separate table I use for my teaching work (I feel like the purity and the creativity of my teaching will be somehow "infected" if I set the associated materials on my administrative desk) and I was sitting there absorbed in a poem by Stephen Dunn when the deluge started. I went to the window to watch, Dunn still playing in my head like underscore. A co-worker walked in. "You believe this rain?" she said. "I know," I said from the window. "I love rain. Nothing like a heavy downpour like this..."
The look in her eyes is hard to describe. It was a look of...confusion. It was as if she truly and honestly couldn't process what I had just said. I expected smoke to wisp out of her ears. She's very smart. It's not a stupidity issue. It's just that, I imagine, she had somehow been -- what? -- conditioned to dislike rain. Rain, quite simply, was a bad thing. Rain stopped kids from playing outside; rain made it harder to drive; rain got things wet. Liking rain, for her, simply does not compute. I know all of these things. But I like rain. And there it is. ... I have conversations like that all the time with my mother. Ha -- I see exactly what you mean. Might it depend where one grew up? Rain in the built-up parts of the city seems dreary. Rain in the country, or anywhere you find fields and woods, is fine. I enjoy going for a run in the rain, or for a walk if I know I can dry out at my destination. Maybe you can teach her about rain, and she can teach you about ties. It might, indeed. But I absolutely refuse to be taught about ties. No. Not Australian. But she is a "beach person," so I guess that's it. It's not a fashion issue, but a neck issue, with the ties. And I guess it's the last convulsive kicks of teen rebellion. I just never imagined I would wear a tie. It just seems to un-bohemian. Which is strange, because my dad, the only truly full-time musician I have ever known, used to wear a tuxedo to work. That said, I do own a Christmas tie with the Grinch on it. I'm quite proud of that one.